Eastern Europe has made its way into a lot of recently published magazine issues. First of all there is Timothy Snyder’s fantastic article in the NYRB on Galicia (requires subscription) “A Core of European Tragedy, Diversity, Fantasy,” in which figures as diverse as Emperor Joseph II, Stanisław Przybyszewski, son of the composer Franz Xaver Mozart, Ivan Franko, Heinrich Himmler and Habsburg police chief Leopold von Sacher-Masoch along with his better-known son, author of Venus in Furs Leopold von Sacher-Masoch. The latest issue of The New England Review includes a translation from Semyon Akimovich An-sky’s novel Among the Pioneers. Born Shloyme Zanvl Rappoport near Vitebsk, An-sky is best known as the author of the Yiddish play The Dybbuk and was the subject of a thorough and fascinating biography that I will have a review of up soon called Wandering Soul: The Dybbuk’s Creator, S. An-sky by Gabriella Safran. The translation of An-sky’s novel was done by Michael R. Katz, whose faculty page at Middlebury College says he is “is at work on ‘counter-stories’ by Tolstoy’s wife and son written in response to Leo Tolstoy’s controversial tale The Kreutzer Sonata.” That is the first I have ever heard of counter-stories. Writers, beware! 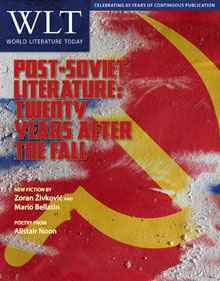 World Literature Today’s latest is devoted to “Post-Soviet Literature: Twenty Years After the Fall” and is full of poetry, fiction, essays, interviews, almost all of it available online. Especially cool is they have a story by Ukrainian writer Tania Malyarchuk, “The Demon of Hunger.” I had heard about Malyarchuk before I could find any of her work available in English. Now, Michael M. Naydan has translated two of her stories (the first is on Belletrista). And then if you have had enough of Eastern Europe’s dark and sinister past you can go to the latest issue of Global Graffiti Magazine and Anastassiya Andrianova’s essay “Something in the Key of A,” which documents the author’s passion for music as she and her family make their way from Kiev to New York City.